This PDF 1.7 document has been generated by Adobe InDesign CC 2017 (Macintosh) / Adobe PDF Library 15.0, and has been sent on pdf-archive.com on 06/10/2017 at 07:32, from IP address 150.101.x.x. The current document download page has been viewed 156 times. File size: 15.7 MB (27 pages). custodianship of the land and waters. All material presented in this publication is protected by copyright. River near the coast. | Rob Blakers. alpine forests to the rugged coastline. 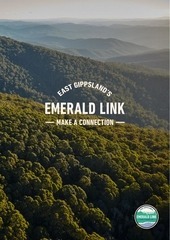 Victoria’s premier wilderness adventure destination. natural areas within this remarkably biodiverse region. in shaping the future economic prosperity of the region. unparalleled natural beauty and importance. unavoidable but can be minimised. pdf, Accessed 28 September 2016, p. 13. 2	Schirmer, J., 2013, Socio-economic characteristics of Victoria’s forestry industries, 2009-2012. 4	East Gippsland Shire, 2013, “East Gippsland Shire Tourism Snapshot—Calendar Year 2013”, http://www.eastgippsland.vic.gov.au/files/654ca705-bf4a4c4a-8154-a1cd00f05a63/East_Gippsland_Shire_Tourism_Snapshot_2013. 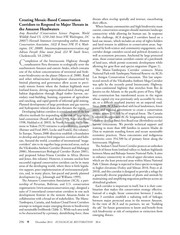 pdf, Accessed 16 October 2016.
natural ecosystems that connect alpine to coastal environments. approximately one third of the state’s threatened species. vegetation and proximity to outside disturbances. future impacts of climate change. 5	Please see Map 14 for reference. 9	See appendix Map 7 for more information. for Conservation, Victoria Environmental Studies Division, p. 24-28. LGA/east%20gippsland.html, Accessed 28 September 2016.
gullies of East Gippsland’s lowland forests. corridor from the coast to the alpine regions. means of achieving biodiversity conservation outcomes. mainland Australia is the solution. 12	East Gippsland Shire Council, “Our Environment, Biodiveristy”, http://www. Victoria's Environment — Biodiversity 2036 (Public Consultation Draft) 2015”, p.
Biodiversity Map, http://www.depi.vic.gov.au/environment-and-wildlife/biodiversity/natureprint, Accessed 28 Spetember 2016.
return to its original state after being disturbed. then connect these to create large protected forest areas. mountain peaks to the coast. Secretariat of the Convention on Biological Diversity, http://www.srs.fs.usda. impacts.&quot; Austral Ecology, 28.4, p. 423-443.
the Royal Society of London B: Biological Sciences 270.1527, p. 1,887-1,892. Central Highlands to climate change.&quot; Department of Sustainability and Environment Technical report, Melbourne. understoreys of ancient tree ferns and rainforest species. been preserved in this unique environment. program, http://www.abc.net.au/news/2009-04-02/felled-old-growth-tree500-years-old/1638514, accessed 3 November 2016.
chance of surviving climate induced wildfire. increased feral animal and weed invasion. and allow industrial logging right to the edges of the Park. forest is isolated and fragmented from land clearing. Mt Ellery is the highest mountain in far East Gippsland. Granite monoliths cap the 1,200 metre high summit. unlike anywhere on mainland Australia. rainforest in an extremely rare ‘overlap’ assemblage. meet, the levels of species richness and beauty are worldclass. ecosystems that make this region so special. cunninghamii)—a nationally listed threatened species. revealing even richer diversity than previously thought. coastal heath and tea tree swamps, rich in birds and reptiles. www.abc.net.au/news/2015-07-20/rare-ferns-found-in-victorian-forest-earmarked-for-logging/6631870, Accessed 12 October 2016. 2014, “Advisory List of Threatened PLants in Victoria”, http://www.depi.vic.gov. au/__data/assets/pdf_file/0005/277565/Advisory-List-of-Rare-or-Threatened-Plants-in-Victoria-2014.pdf, Accessed 12 October 2016, p. 7. 22	Please see Maps 10, 11 and 12 in Appendix for more information. This file has been shared by a user of PDF Archive. Document ID: 00681839.